By The Royal Decreed of the Order of Truthsurfers, I give the following DFLers the first ever Minnesota’s ‘Spit In Your Eye’ award for gifting billionaire Carl Pohlad with a stadium at our hard working expense…way to stick it to the very people you represent! T Bonoff, T Clark, Foley, Higgins, Hottinger, Dean Johnson, Gov. Steve Kelley, Kiscaden, Kubly, Langseth, S. Marko, J. Metzen, S. Murphy, Saxhaug, Scheid, Skoe, Skoglund, Sparks, Stumpf, Tomassoni, Vickerman and Wiger. 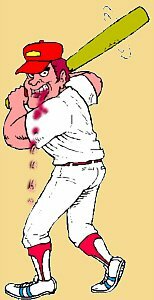 "Tiger Randall's threat to spit in the pitcher's eye as he rounds second base may have to be taken seriously after all. He's already droolin' tobacco juice all over his jersey..."
Now, the before mentioned DFLers have coughed up a big one, but instead of hitting the cup, they put it in our eye. They too are spitters...only we've just became the bucket! I can't wait for the Vikings to come knocking next year. This is hilarious, Ms. Spitoon.